Wood and Tree Chipping in Qualicum, Parksville and Nanoose. We specialize in chipping tree waste from your property. Storms, tree removals and tree/hedge trimming projects all create significant amounts of green waste and tree debris on your property. Tree branches and limbs can be big and heavy and their odd shapes don’t make them very easy to transport. This is why most arborists have their own wood or tree chipping equipment. It makes clean up after a big tree project a breeze and the chipping process reduces the amount of volume in our trucks and makes the materials easier for nature to break down. Some customers even want the chips for their own landscaping projects and we’re happy to oblige! 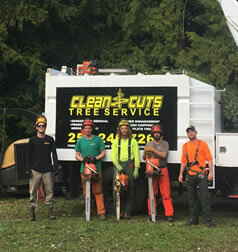 Clean Cuts Tree Service Ltd. is a tree service company based out of Qualicum Beach and serving customers from Qualicum to Nanoose. We specialize in tree and wood chipping services. If we’ve completed tree work on your property or you’ve had trees come down in a recent wind storm we can provide chipping services to clean up the mess. Why Choose Clean Cuts Tree Service Ltd. For Your Wood and Tree Chipping? 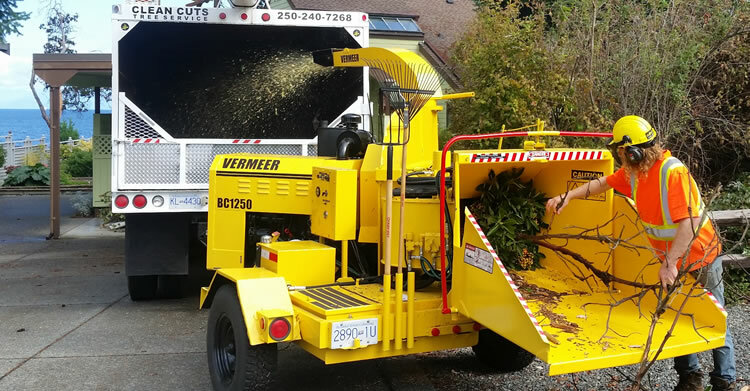 When you choose to work with Clean Cuts Tree Service Ltd. for your tree chipping project in the Central Vancouver Island area you’re choosing to work with a team of skilled professionals. If you’d like to receive an estimate from Clean Cuts Tree Service Ltd. for your next tree or wood chipping project please give us a call 250-240-7268 or fill out our contact form and we’ll get right back to you.